Has anyone here ever bathed in a tub filled with ice water? 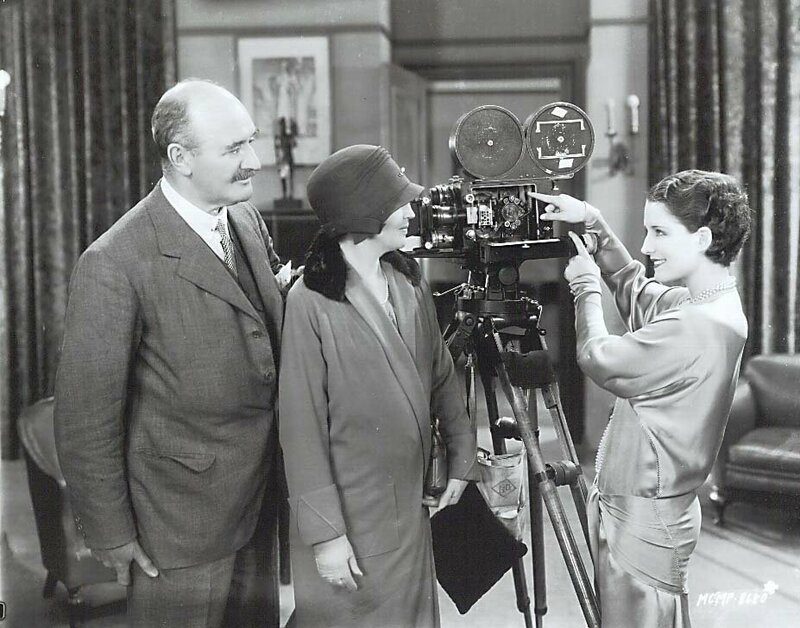 Norma Shearer did. Often. That was but one of her defenses against the encroachments of age. The others included midnight calisthenics, obsessive dieting, hours in front of a mirror before she’d go out to walk her dog around the neighborhood --- all of this decades after the stardom had faded and gone. 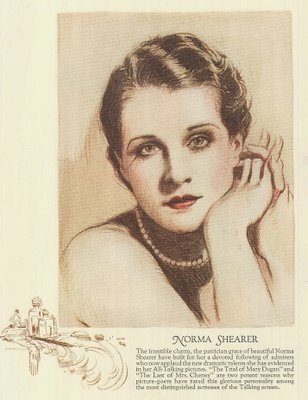 Living that fairy tale life of Norma Shearer the movie star was great when the public cared, and indeed they did for a very long time, but eventually that party had to end, leaving everyone to go home --- except Norma. In the end, she gave up her sanity for the sake of maintaining appearances, and died, I suspect, without ever knowing how great she really was. Most of us knew Norma Shearer only from the stills. Movie books published in the sixties and seventies would include tantalizing images from A Free Soul or The Divorcee, along with that breathless account of how the audience gasped when Clark Gable "slapped" Norma in their first movie together. How were we to know that intervening years had transformed a shove into a slap in the public’s recall? I never saw any of Norma’s films until Turner began broadcasting them in the wake of their MGM library purchase. Yes, I know they were syndicated prior to that, but we sure didn’t have access to them down here. Why would a local station play an obscure relic from the early thirties when they could reach a much bigger audience with another run of Teahouse Of The August Moon or It Happened At The World’s Fair? People wanted color on their TV sets by the mid-sixties, and an MGM field man would have a lot more success peddling the newer feature packages than those ancient "Pre-48 Greats." So it came as quite a surprise when Turner Classic Movies unveiled all their pre-code Shearers --- it was as though sunken treasure had been brought up from the deep, and a new old star was born. Forty-dollar coffee table books celebrated Norma’s legendary portrait sittings with George Hurrell. Lines formed around the block to see Let Us Be Gay at the Castro in San Francisco and The Divorcee at New York’s Film Forum. As is so often (and sadly) the case, we’d only discover Shearer more than a decade after her commitment to the Motion Picture Country Home, by which time even Norma had forgotten those days when she was "like a cork on a sea of wantonness." The strong mother and weak father --- stardom’s recipe for more names than we need recount here, but Norma’s differed only to the extent that both her parents, and a sister as well, endured lifetimes of mental illness of one form or another, and it was this spectre that would haunt, and finally overtake, Norma as well. She’d begun as a typical movie-struck kid in Montreal, Canada --- on one occasion chasing serial queen Pearl White’s limousine during a personal appearance stopover. Shearer’s mother was the pushy sort and trained the girls to act in kind. The three of them, minus Mr. Shearer, bailed out of hearth and home (Dad seems to have gotten a pretty raw deal in all of this) and made their way to New York, where cold-water flat accommodations no doubt resembled something out of The Godfather – Part 2. She taught me how to take it on the chin was Norma’s latter-day tribute to Mom, but potential employers like Flo Ziegfeld weren’t interested, despite letters of introduction brandished by the girls. Chubby legs, a "lazy eye" (that would always be a problem), and bad teeth were just some of the deficiencies spelled out by a tactless Ziggy. 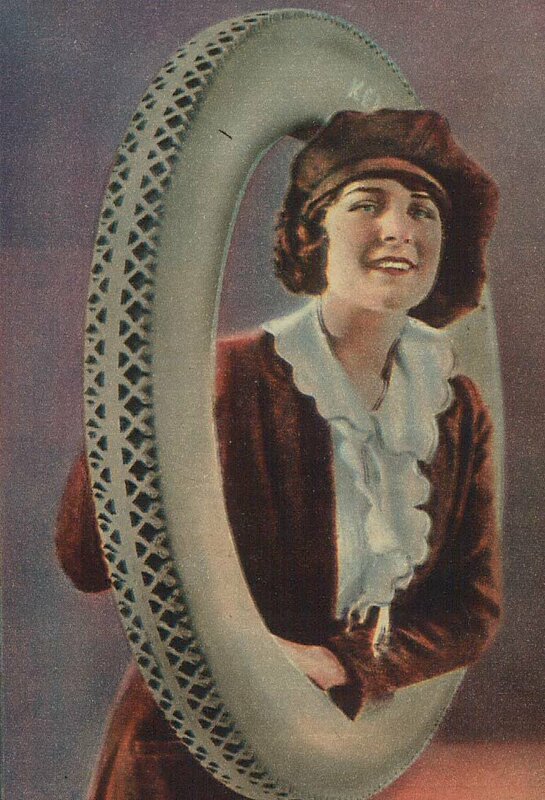 Indefatigable Norma soldiered on with what crumbs she could gather modeling (such as this tire ad she posed for in the early twenties), or doing extra work on Long Island (she’s an extra in Griffith’s Way Down East). Coming up the hard way only stiffened her resolve, and Shearer merely shrugged off rejections that would have sent most of us turning tail for home. 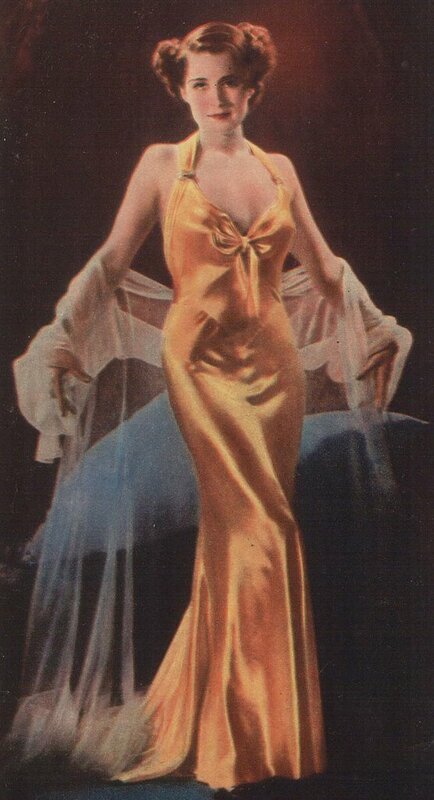 Being a motion picture actress is the pitch of ecstasy, she once said, and toward fulfillment of her goal, Norma left no obstacle standing. Her embryonic stage, viewed here in a 1927 silent, The Demi-Bride, was not the Shearer we’d come to embrace. At least we assume she isn’t, based on the handful of pre-talkies we’ve seen (some are lost), wherein Norma appears to have been a standard issue leading lady in largely indifferent roles. The legs on view here would be artfully concealed by the time she took greater control of her screen image, an objective she’d reached by October 13, 1928, the day this shot of Norma conducting an on-set tour was taken (wonder if she understood the workings of that camera as well as she pretends here). Triumph in talkers meant prominence in the sales annual, so Norma got her own page, and mention of her first two hits with sound --- The Trial Of Mary Dugan and The Last Of Mrs. Cheney. 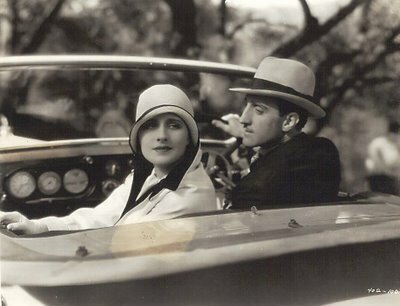 That’s Broadway vet and made-for-the-talking screen Basil Rathbone sharing the roadster with Shearer’s Mrs. Cheyney --- this glorious antiquity shows up from time to time on TCM. Norma’s transformation to pre-code siren will be more the subject of next week’s Part 2, but for a sampling, here she is with Clark Gable, the man who did not slap her, in A Free Soul. Finally, Shearer and husband Irving Thalberg are dressed out in accordance with Marion Davies’ New Year’s Eve invitation --- guests were instructed to arrive in kids-wear. 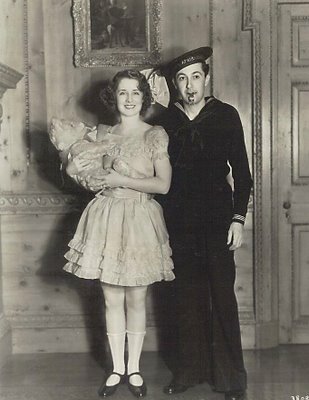 Well, old Hollywood was nothing if not weird at times, and "baby parties" were not uncommon during those years. A psychologist might explain what motivated movie stars and studio executives to parade about for an entire evening in rompers. It sure beats me. Anyone got any theories? Where was Norma's brother Douglas in all of this? Do you know when he went to Hollywood? Did he go with his sisters? He was MGM's sound genius. "The pitch of ecstasy." There's a phrase to save for use in some future erudite conversation! In regards to the Baby Parties, it is probably connected to the Baby Burlesque's that Hollywood was fond of at the time too. Yesterday I've heard on British radio an interview with the legendary Baby Peggy (Margaret Montgomery) she's 88, very loquacious and immensely eloquent. She told extraordinary stories about being a professional child in Hollywood. I am sure she would be able to tell you why they were fascinated about "Baby Parties" in Hollywood. She would know more than anybody about it. Hi Marco --- I'm planning to deal with Douglas Shearer in next week's Part Two on Norma. There's a lot of ground to cover with this actress, and a lot more good stills I'd like to post. Also, to Oscar --- thanks for the tip about Baby Peggy. You're right --- she is one who could fill us in on those "baby parties" --- in fact, she may be the last one surviving who could! Johnny, Here's a good one. (in fact one of my "fav's" out of the "repertoire"): I couldn't have been much-more than 4-5 years old, when my mother took me one afternoon, to her dress-maker on Rodeo Dr., in B.H. There was an enormous toy-store up the street, called "Toy Menagerie". I guess I told her I was going to "hang-out" there for awhile, and she allowed me to go on my own. When she comes looking-for me, no "R.J."! She and my father start to panic! They look all-over, no sign of little "R.J." -- when according to Dad, here I come up the street,hand-in-hand, being escorted by a well-dressed Beverly Hills matron. "Your little-boy seemed lost", She says. "He's so cute I wanted to take him home!" My mother was so relieved to find me, she didn't pay much-attention as to who was delivering-me, but my father recognized her instantly, and thanked her. In later-years,I would kid with him as to why in hell he didn't let "Mrs. Thalberg" take me home as she wanted to. "I would have sent you a check every week!" I would chortle! R.J. Fantastic Norma story, R.J. Why couldn't I have had your childhood? How much -- and understand, I'm not greedy! Rick.